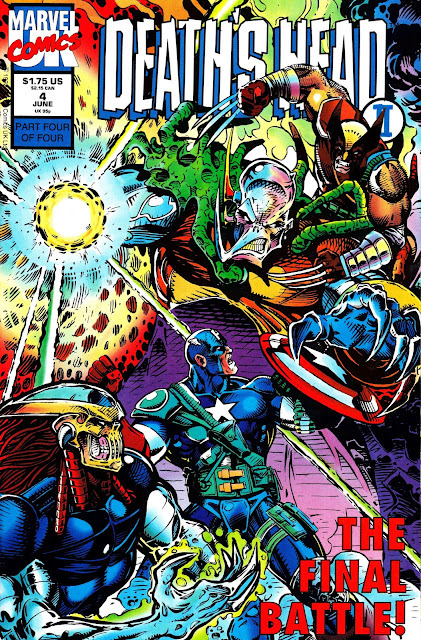 This is it: Ground zero of the Marvel UK Genesis '92 sub-universe. 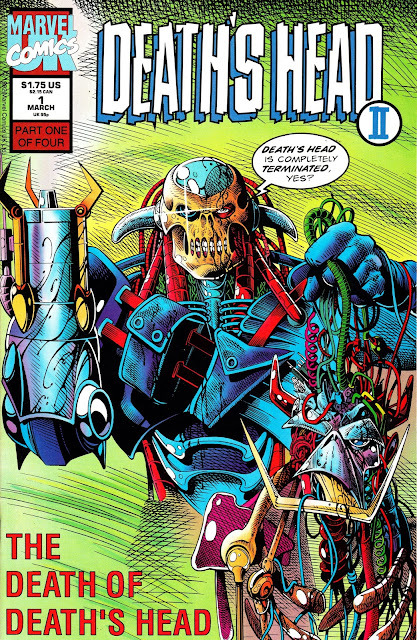 This four-part limited series was the warm-up act for the whole British shebang, dispensing with the TRANSFORMERS-era first incarnation of DEATH'S HEAD in favour of a far more - ahem - nineties replacement (incoming British chief Paul Neary nixed already in train plans for more adventures of the well-liked original) designed by Liam Sharp. It also set the (briefly) winning M-UK formula of all-out action, high body counts, unfeasible combinations of muscle and heavy ordinance and inconsequential cameo appearances by bankable characters from the US stable. 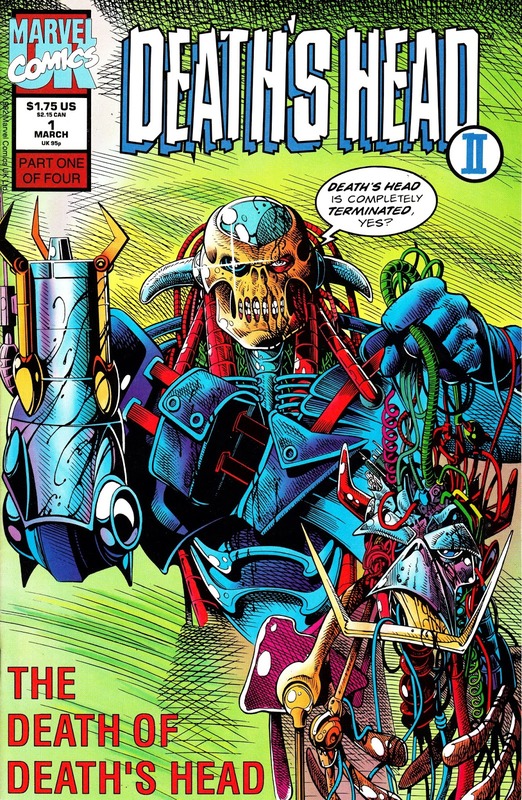 Although none of the core G92 characters appear here, each issue contains several pages of editorial and house ads previewing the initial raft of OVERKILL characters (Digitek, The Knights of Pendragon, Hell's Angel, Warheads and Motormouth). 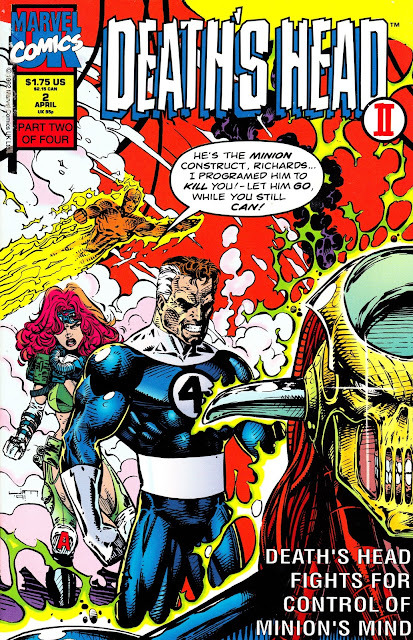 Each issue had a flip cover design, only the fourth issue has a genuine wrap-around design. Surprisingly, DHII wasn't part of the original OVERKILL line-up. 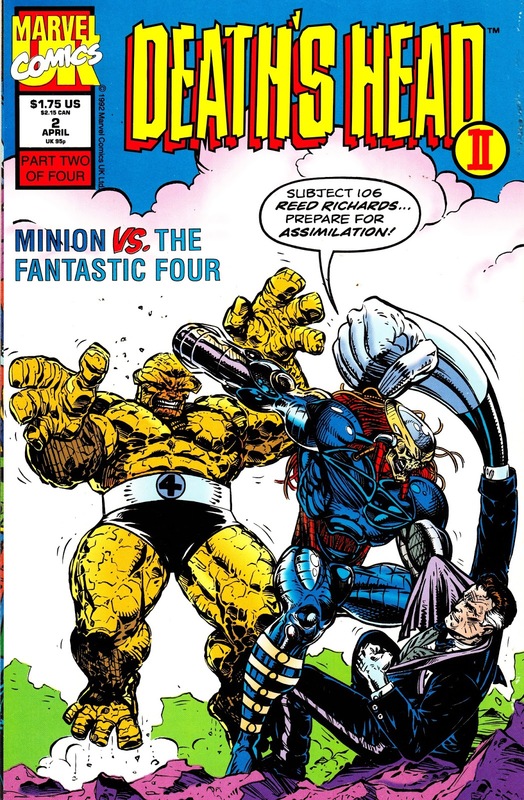 Possibly because of the sheer number of US characters featured throughout, the strip was initially omitted but once Arundel House reversed their decision not to include established super-powered characters in their British home, the reprints began in issue 12 and ran through issue 22. Collectively known as The Wild Hunt, Marvel UK announced a trade paperback collection (their first) for early 1994 but it was cancelled, along with everything else, when the line was suddenly shuttered. 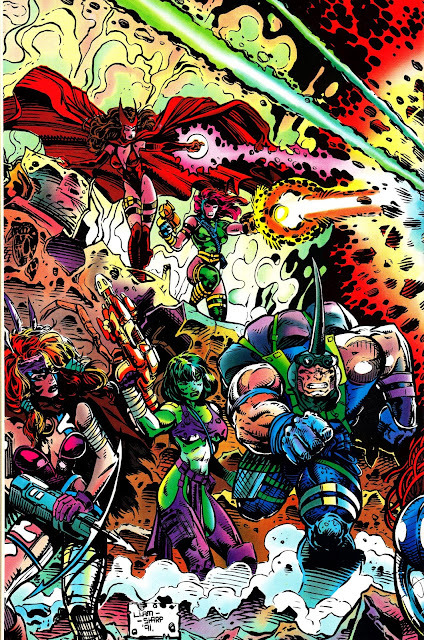 To date, there has been no reprints of any of the Genesis 92 line. Some sales data is available, courtesy of THE STANDARD CATALOG OF COMIC BOOKS published by Krause. That includes information about the number of issues ordered - based on retailer orders - by Capital City Distributors. In a more fractured marketplace, Capital were only one of several large (notably alongside Diamond) and smaller distributors given shop owners an option of where to acquire their stock. As such, these shouldn't be interpreted as overall orders but simply those placed with Capital. Nevertheless, they give a sense of the relative success of the title... and Marvel UK's rapid decline. The usual health warning that these figures don't reflect final sales to punters also applies. Issue one - through Capital - shipped 37,500 copies, raising to 39,000 for the fourth issue. 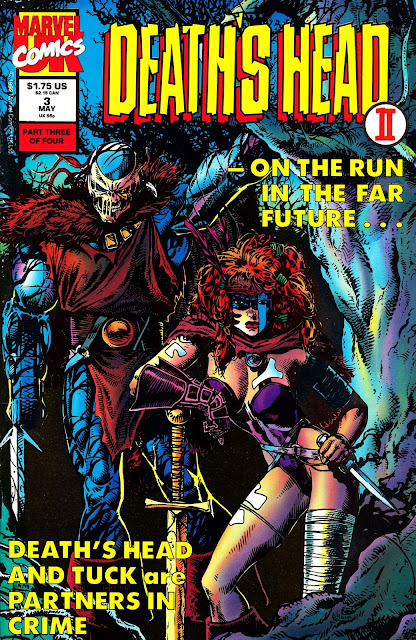 This leap (issues 2-3 settled to around the 23,000 mark) may have been explained by the host of familiar faces in the denouncement (Scarlet Witch, the Rhino, Daredevil, Doctor Strange, The Punisher, Captain America and Wolverine... albeit in a possible, and therefore irrelevant, 2020 timeline) or by retailers having time to increase their orders after the first sold better than anticipated. All those numbers pale into insignificance compared with the Capital order of 105,900 for the first issue of the DHII ongoing book. But success proved short-lived, by the time the 16th and final issue of the ongoing book appeared, orders had dipped to 7,450 (still healthy compared to some of DHII's companions: DARK ANGEL 17 bowed out with a paltry 4,950). The popularity of the character explains why - as sales across the board dropped - he became omnipresent throughout the Genesis 92 line as Marvel tried to give every book a much needed sales boost. M-UK even invested in a DHII costume for personal appearances. See here and here for some stills from THE EXPLOITS OF SPIDER-MAN. 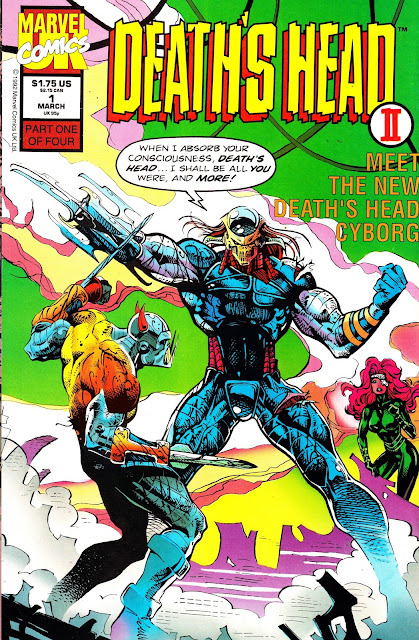 The first issue - deemed a "hot book" in the boom years, was reprinted with a silver ink cover. 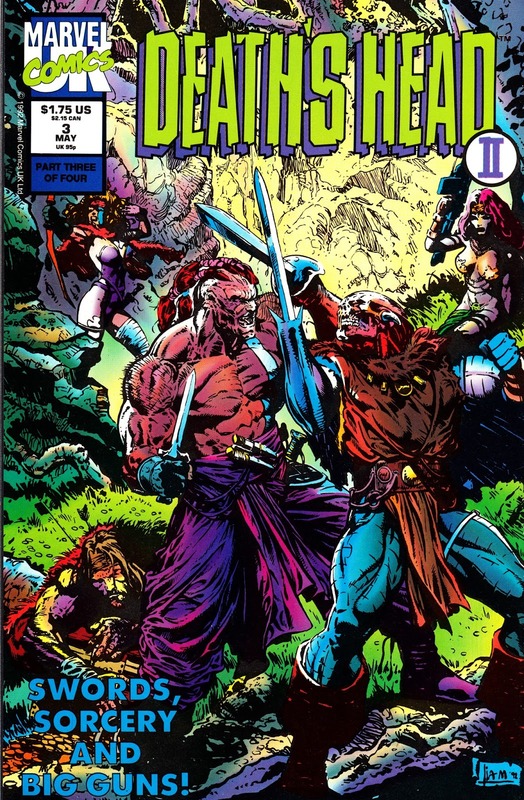 Tellingly, the original DH has made several return appearances in the mainstream Marvel Universe in recent years whilst his successor, along with the rest of the sub-universe characters, have - prior to the upcoming REVOLUTIONARY WAR - languished unloved in comic book purgatory.